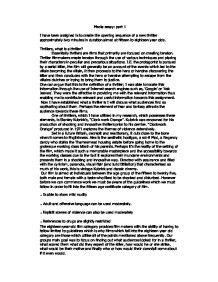 Media essay: part 1 I have been assigned is to create the opening sequence of a new thriller approximately two minutes in duration aimed at fifteen to eighteen year olds. Thrillers, what is a thriller? Essentially thrillers are films that primarily are focused on creating tension. Thriller filmmakers create tension through the use of various techniques and placing their characters in peculiar and precarious situations. I.E. the protagonist is pursued by a serial killer, the film will generally be an account of the events which led to the villain becoming the villain, it then proceeds to the hero or heroine discovering the killer and then concludes with the hero or heroine attempting to escape from the villains clutches or trying to bring them to justice. One can argue that this is the definition of a thriller; I was able to locate this information through the use of Internet search engines such as, 'Google' or 'Ask Jeeves'. They were the effective in providing me with the relevant information thus enabling me to contribute relevant and useful information towards this assignment. Now I have established what a thriller is I will discuss what audiences find so captivating about them. Perhaps the element of fear and fantasy attracts the audience towards these films. One of thrillers, which I have utilised in my research, which possesses these elements, is Stanley Kubrick's, "Clock work Orange". ...read more. We had decided that our film would be filmed at night in order to make the film appear more sinister, this is due to the fact that people associate darkness with fear and evil. Throughout our production time we encountered difficulties in ascertaining a video camera, which actually worked properly however we eventually were able to secure a working camera. the group had decided that filming would take place at any available time slot in which all group members would attend. Our first day of filming was set for Thursday the tenth of March. 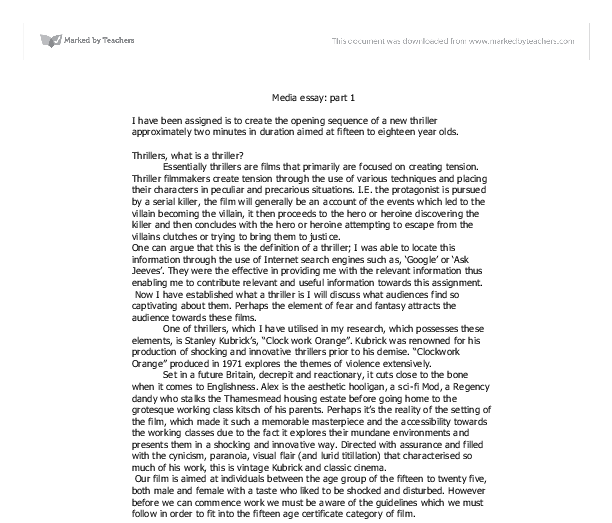 The uses and gratification theory is a vital segment of the planning of the production section of the essay. Firstly let us establish what is the uses and gratification theory. Many argue that this is the most difficult theory that we as media students must learn. We all have different uses for media and we make choices over what we want to watch. In other words, when we encounter a media text its not just mindless entertainment it does actually convey a message towards the individual viewing it, he or she may not no it but they may subconsciously be being influenced by what he or she view, read or hear such is the power of media. What makes our thriller a thriller is the fact we have utilised various aspects of other thrillers. ...read more. Initially during editing, group members who had worked on the editing process had been able to give the film a dynamic perspective due to the way the shots just flowed and seemed natural which added to the disturbing nature of the film however after a certain group member had realised that their contribution in the eyes of the other group members had been minimal and in fact the certain group member had hindered the groups progress. The lack of fluidity is made evident in the last shots of the film when the camera zooms out from the victim. This shot focuses to long on the victims face and then cuts to he same shot, it doesn't make sense and confuses the audience. One of the positive comments, which can be drawn from the, "Silent Knife' production is the use of sound. The theme music utilised in our production is effective in capturing the audience's attention and also in creating tension through the use of the ominous orchestral music. One wonders after hearing that music what lurks beneath the floorboards of in the closet. Also I must comment on the victims acting, It enabled the audience to gain a degree of insight into how she is feeling at the time, her cries add to the disturbing nature of the film. In conclusion the groups finished product is not necessarily bad however it had the potential to be great and was not due to the immaturity and lack of focus within the group. ...read more. The audience can understand this, because the Romans are well-equipped with weapons to match their uniforms. They also have a hierarchy of different people, whereas the Germans improvise, using axes or clubs and are very dirty. The Romans are also physically more attractive than the Germans who have beards! It tells the audience that she might be the intelligence of the team. As the horse jumps, the camera moves under the horse showing a shot from below. This makes the horse look big and powerful, the fact that Alex is in control of the horse represents that she knows what she is doing and is very daring and ambitious. the sequence continues we get extreme close ups of this mystery man and what he is wearing. The man is scruffy and not dressed smartly at all. As it continues we see the man getting into a car when we get to see a close up of his face. This can be quite comical as they are being very obvious and could easily be seen but never do. There is a non-diegetic sound, which is used at the start when they are escaping. This is 'Bluegrass' or country and western music. They needed to feel the pain and suffering of the blacks and resent the white race. So I suggested we use a recognisable symbol from the holocaust that was responsible for millions of innocent murders. The Star of David labeled every Jew as if they were a herd of cattle, some lower being that deserved no pride. It gives shadows on their faces and makes them look sinister, therefore making the audience presume they are the 'bad guys'. The opposite effect is used on Alex, using high key lighting, so the audience presume the opposite. Other effects such as spotlights are also used when the bracelet is in the frame, to show its importance.